This section of gallbladder, which includes the mass in relation to the gallbladder mucosa and wall, displays a well-preserved gallbladder mucosa comprised of bland cuboidal cells with no atypia. The mucosa is intimately associated with, and in areas undermined by, a proliferation of atypical cells. 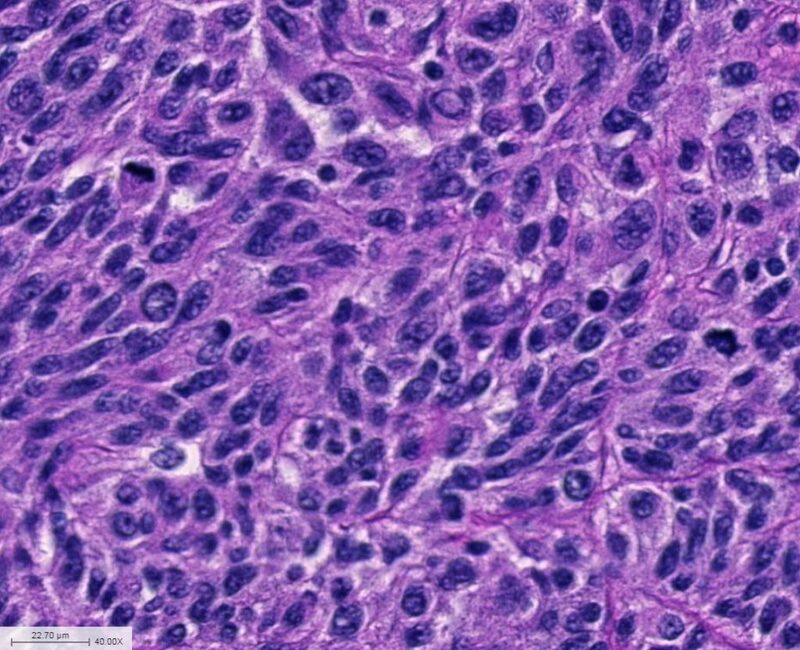 The neoplastic cells are variably spindled to epithelioid, with abundant mitotic activity. The spindled cells have fairly uniform chromatin, while the epithelioid cells contain prominent nucleoli, discohesive growth, and abundant pink cytoplasm. 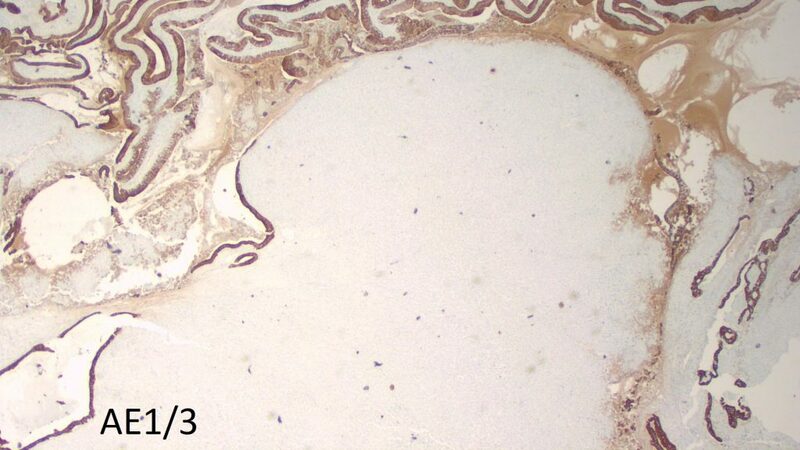 The lesional cells are positive for S100 and Melan-A, and are negative for AE1/AE3. This is an example of metastatic melanoma forming an intraluminal gallbladder mass that clinically mimicked a primary gallbladder polyp. 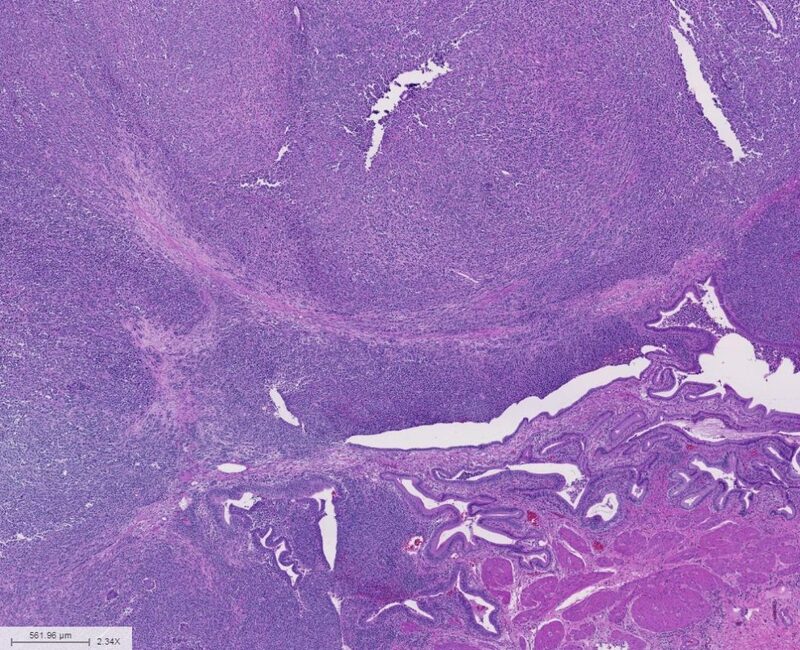 This patient had a known history of metastatic melanoma, but melanoma was not expected in this site. 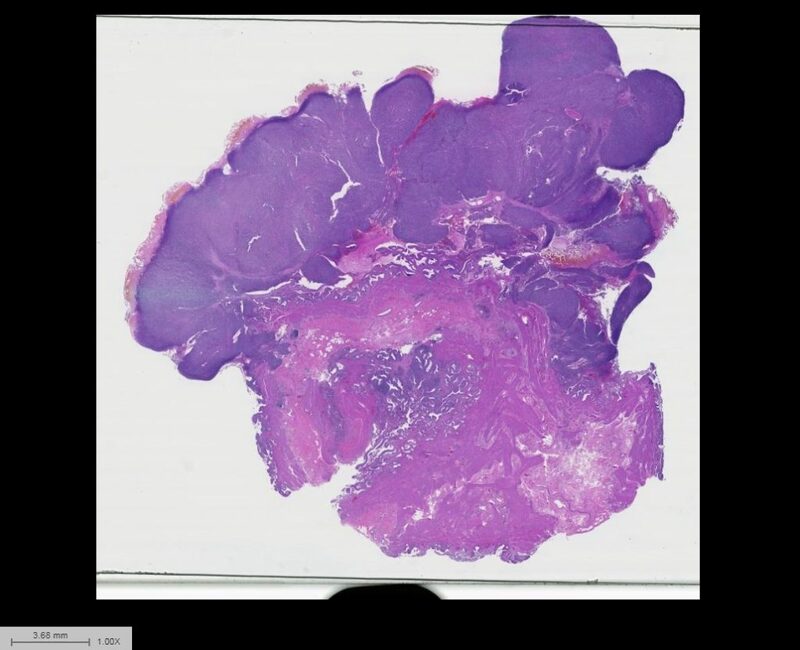 The histologic features highlight the classic descriptor of melanoma as “the great mimicker”—this tumor has both spindled-type morphology and epithelioid-type morphology. 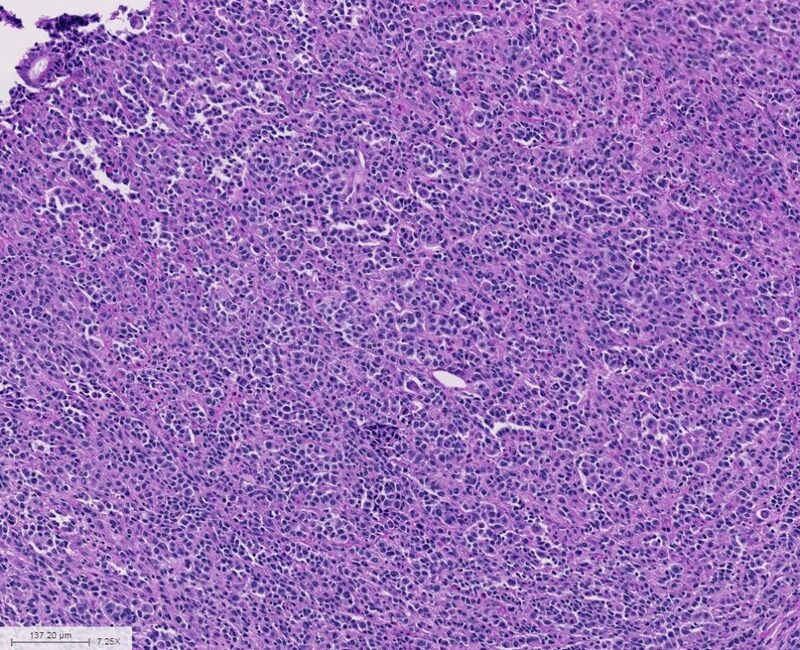 The differential diagnosis of malignant lesions with spindled morphology includes leiomyosarcoma and sarcomatoid carcinoma, and similarly the differential diagnosis of epithelioid neoplasms includes both sarcomas and carcinoma. 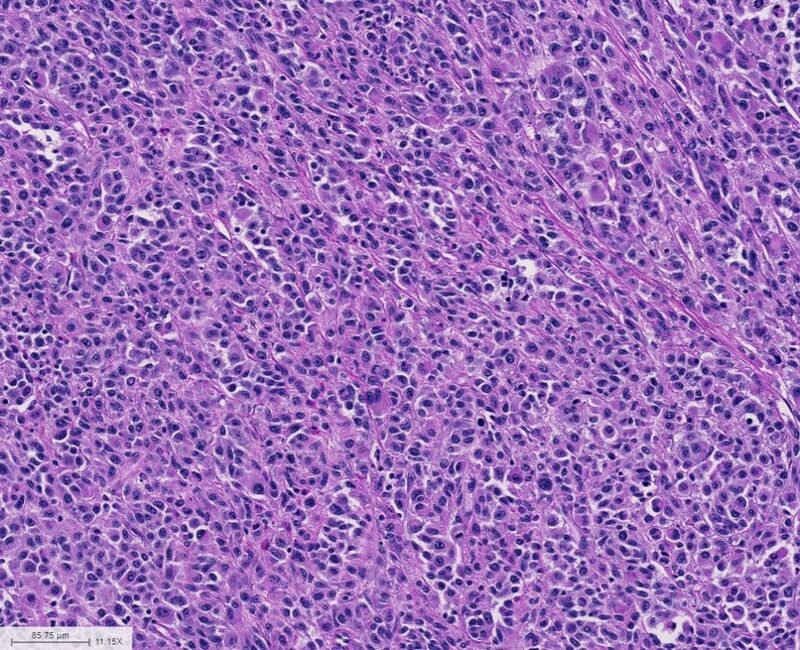 The differential diagnosis of “big pink cell tumors” should always include melanoma, hepatocellular carcinoma, adrenocortical carcinoma, and renal cell carcinoma. This is particularly challenging in the location of the gallbladder, as the liver, adrenal and kidneys are all in close proximity. 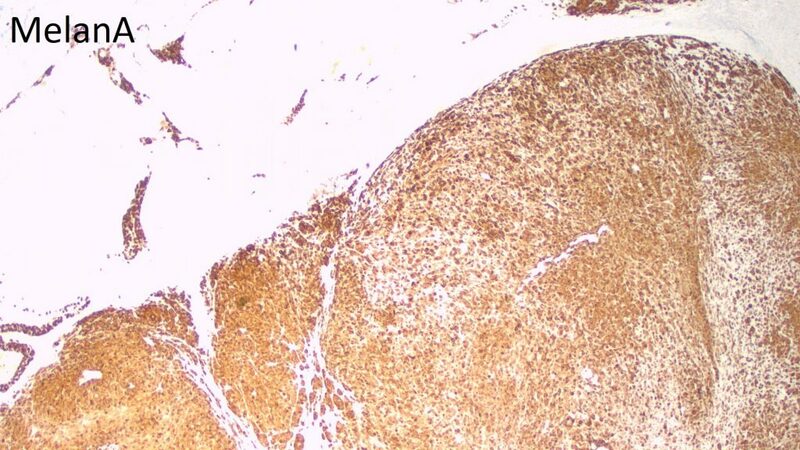 By immunohistochemistry, most melanomas label for S100, SOX10, HMB45, Melan A and MITF, and are negative for cytokeratins. Melanomas may contain melanin pigment, however hepatocellular carcinomas may contain intracytoplasmic bile pigment, which is more yellow than melanin (which is more brown). 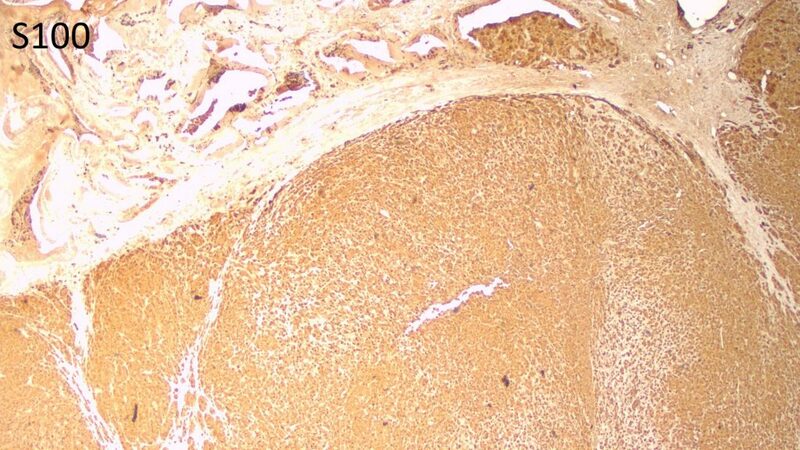 In addition, hepatocellular carcinomas and adrenocortical carcinomas may be negative for broad spectrum cytokeratin, mimicking melanoma or sarcoma. A broad immunopanel and through clinical history is essential. 1. Magro CM, Crowson AN, Mihm MC. Unusual variants of malignant melanoma. Mod Pathol. 2006 Feb;19 Suppl 2:S41-70.